The Flower themes are designed to be simple, attractive and flexible. Available in a range of colours, these themes are sure to suit all of your needs. The theme is a fixed width of 960px, and the sidebar can be position on the left, right or not displayed at all, to maximise the screen real estate. It also includes customised buttons, comments and blockquotes. Flower Theme - Base CSS (pink). November 17, 2010: First release (v1.0). New: added styling to owindows. I think you just set the bar higher for Wikidot themes. 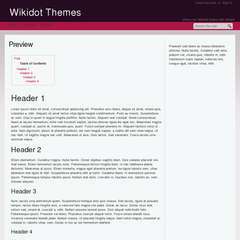 Finally wikidot starts being a site with good-designed themes. They should include your theme as default. EDIT: this is the code for fixing, append at the end. Thanks for pointing this out. I've just updated the theme to adjust the buttons. I also improved the appearance of all wikidot popups/dialogues (i.e. .owindow).